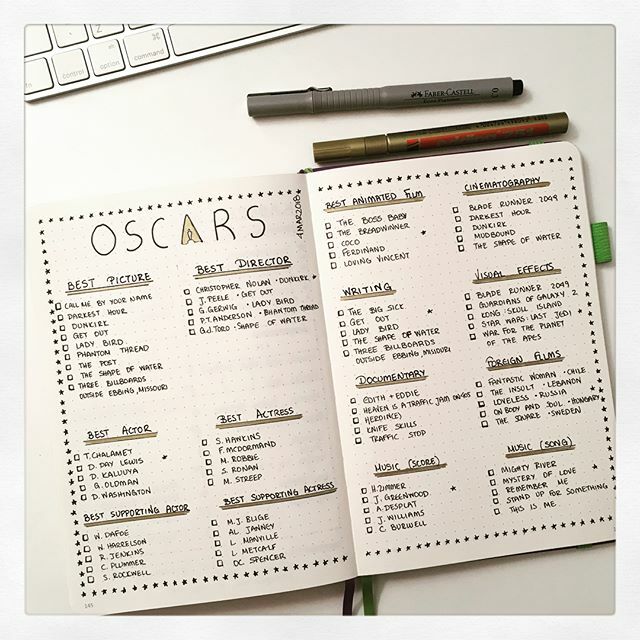 I keep Oscars 2018 predictions in my journal! Oscars night is getting closer. I totally love the Oscars race and the fuzz about it! I try to watch every movie before the big night, so as to have my own opinion! It is like a ritual for us in the house! Unfortunately, due to time difference, we cannot watch the seremony live, but again there is some agony to check it out first thing in the morning!!! Here is the spread I did for the nominations and winners of this celebration! I kept it plain. I used a gold marker so as to add some bling to it. I haven’t seen all the movies nominated but I made a few guesses there( the ones with the stars). I am really looking forward to it!!!! The layout is inspired by @bullettobetsy!